In this blog post, I will give an introduction to an interesting data mining task called frequent subgraph mining, which consists of discovering interesting patterns in graphs. This task is important since data is naturally represented as graph in many domains (e.g. social networks, chemical molecules, map of roads in a country). It is thus desirable to analyze graph data to discover interesting, unexpected, and useful patterns, that can be used to understand the data or take decisions. 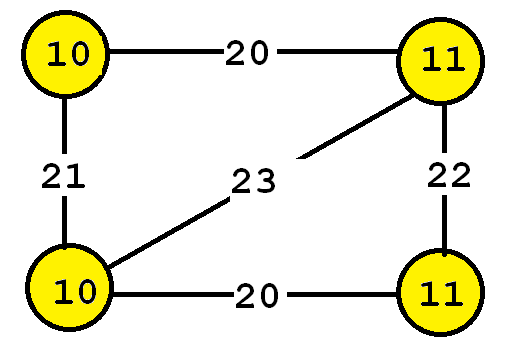 This graph contains four vertices (depicted as yellow circles). These vertices have labels such as “10” and “11”. These labels provide information about the vertices. For example, imagine that this graph is a chemical molecule. The label 10 and 11 could represent the chemical elements of Hydrogen and Oxygen, respectively. Labels do not need to be unique. In other words, the same labels may be used to describe several vertices in the same graph. For example, if the above graph represents a chemical molecule, the labels “10” and “11” could be used for all vertices representing Oxygen and Hydrogen, respectively. Now, besides vertices, a graph also contains edges. The edges are the lines between the vertices, here represented by thick black lines. Edges also have some labels. In this example, four labels are used, which are 20, 21, 22 and 23. These labels represents different types of relationships between vertices. Edge labels do not need to be unique. The graph on the left is said to be a connected graph because by following the edges, it is possible to go from any vertex to any other vertices. For example, imagine that vertices represents cities and that the edges are roads between cities. A connected graph in this context is a graph where it is possible to go from any city to any other cities by following the roads. 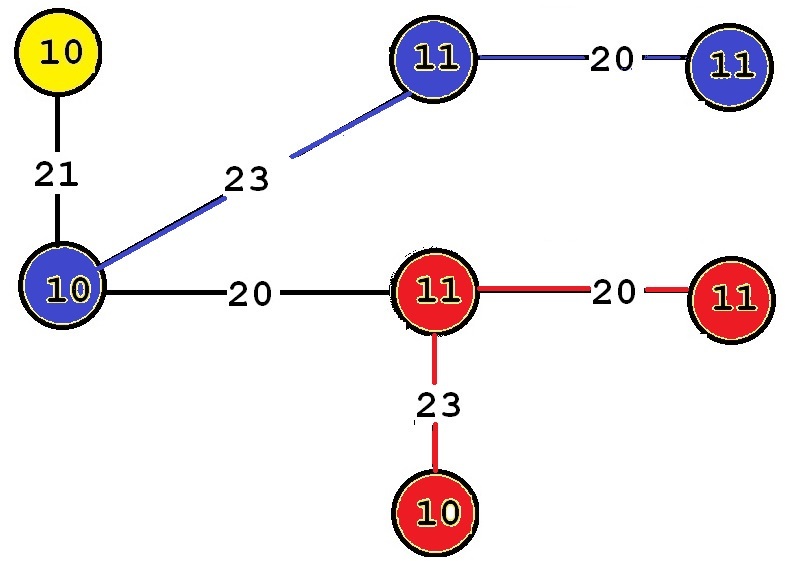 If a graph is not connected, it is said to be a disconnected graph. For example, the graph on the right is disconnected since Vertex A cannot be reached from the other vertices by following the edges. In the following, we will use the term “graph” to refer to connected graphs. Thus, all the graphs that we will discuss in the following paragraphs will be connected graphs. 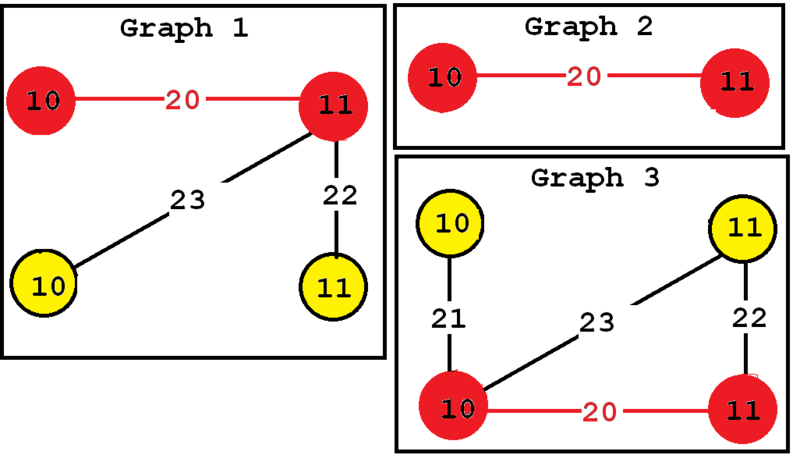 It is also useful to distinguish between directed and undirected graphs. In an undirected graph, edges are bidirectional, while in a directed graph, the edges can be unidirectional or bidirectional. Let’s illustrate this idea with an example. The graph on the left is undirected, while the graph on the right is directed. What are some real-life examples of a directed graph? For example, consider a graph where vertices are locations and edges are roads. Some roads can be travelled in both directions while some roads may be travelled in only a single direction (“one-way” roads in a city). Some data mining algorithms are designed to work only with undirected graphs, directed graphs, or support both. Now that we have introduced a bit of theory about graphs, what kind of data mining task can we do to analyze graphs? There are many answers to this question. The answer depends on what is our goal but also on the type of graph that we are analyzing (directed/undirected, connected/disconnected, a single graph or many graphs). In this blog post, I will explain a popular task called frequent subgraph mining. The goal of subgraph mining is to discover interesting subgraph(s) appearing in a set of graphs (a graph database). But how can we judge if a subgraph is interesting? This depends on the application. The interestingness can be defined in various ways. 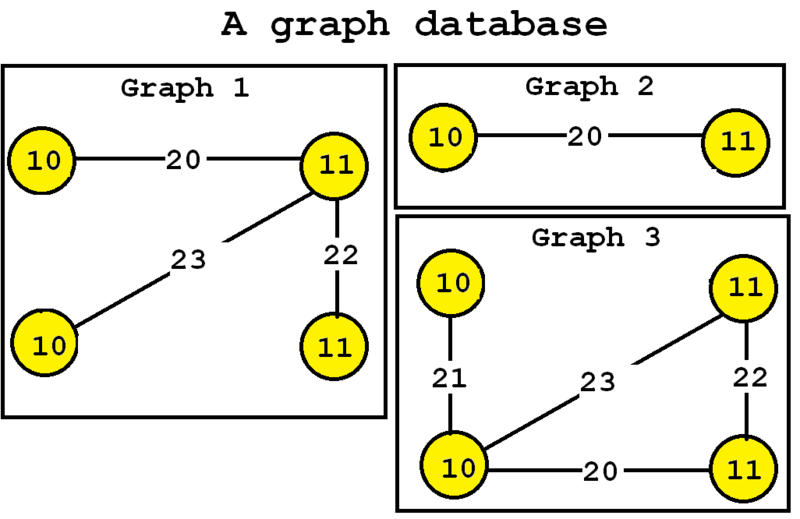 Traditionally, a subgraph has been considered as interesting if it appears multiple times in a set of graphs. In other words, we want to discover subgraphs that are common to multiple graphs. This can be useful for example to find association between chemical elements common to several chemical molecules. a parameter called the minimum support threshold (minsup). Now a good question is how to set the minsup parameter? In practice, the minsup parameter is generally set by trial and error. If this parameter is set too high, few subgraphs will be found, while if it is set too low, hundred or millions of subgraphs may be found, depending on the input database. 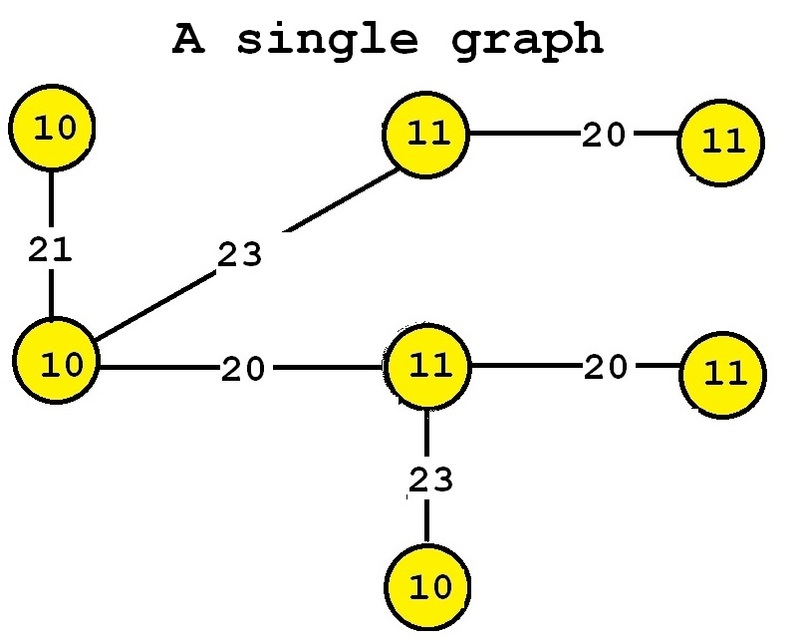 Now, in practice, which tools or algorithms can be used to find frequent subgraphs? There exists various frequent subgraph mining algorithms. Some of the most famous are GASTON, FSG, and GSPAN. 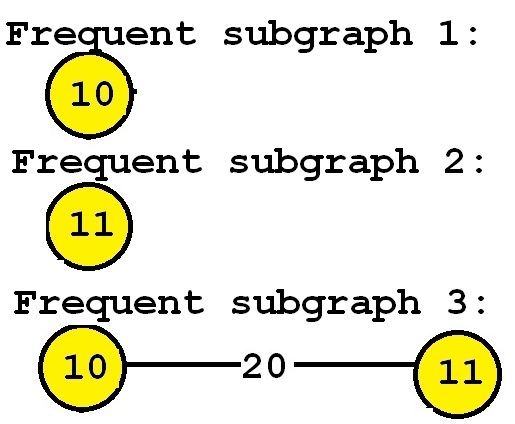 These subgraphs are said to be frequent because they appear at least twice in the input graph. For example, consider “Frequent subgraph 5”. This subgraph has a support of 2 because it has two occurrences in the input graph. Those two occurrences are highlighted below in red and blue, respectively. Algorithms to discover patterns in a graph database can often be adapted to discover patterns in a single graph. In this blog post, I have introduced the problem of frequent subgraph mining, which consists of discovering subgraphs appearing frequently in a set of graphs. This data mining problem has been studied for more than 15 years, and many algorithms have been proposed. Some algorithms are exact algorithms (will find the correct answer), while some other are approximate algorithms (do not guarantee to find the correct answer, but may be faster). Some algorithms are also designed to handle directed or undirected graphs, or mine subgraphs in a single graph or in a graph database, or can do both. Besides, there exists several other variations of the subgraph mining problem such as discovering frequent paths in a graph, or frequent trees in a graph. Besides, in data mining in general, many other problems are studied related to graphs such as optimization problems, detecting communities in social networks, relational classification, etc. In general, problems related to graphs are quite complex compared to some other types of data. 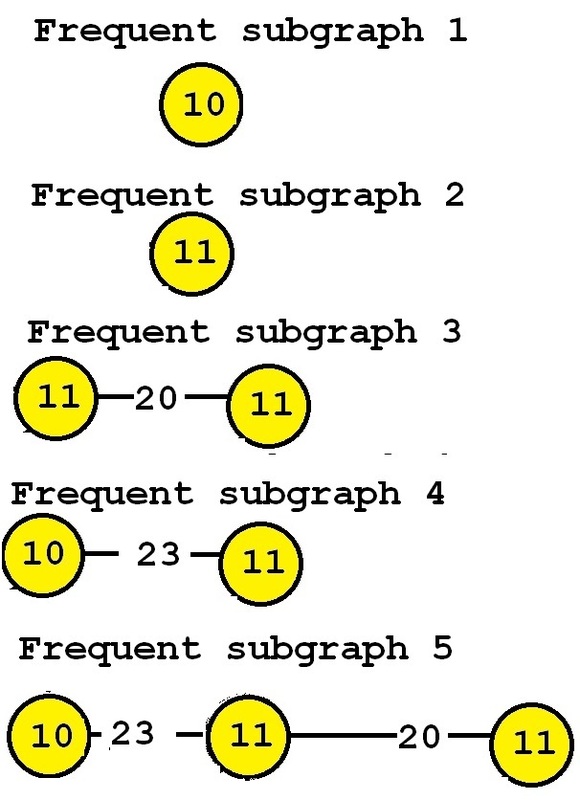 One of the reason why subgraph mining is difficult is that algorithms typically need to check for “subgraph isomorphisms“, that is to compare subgraphs to determine if they are equivalent. But nonetheless, I think that these problems are quite interesting as there are several research challenges. I hope that you have enjoyed this blog post. If there is some interest about this topic, I may do another blog post on graph mining in the future. Philippe Fournier-Viger is a professor of Computer Science and also the founder of the open-source data mining software SPMF, offering more than 120 data mining algorithms. Why researchers should make their research papers available on internet? Thank you for your time and effort to write this post. In my opinion, mining frequent subgraphs is an interesting and challenging topic since it requires more complex steps during mining process such as graph isomorphism checking that wasn’t mentioned in your post. In “Mining frequent subgraphs in a single graph”, I think the frequent subgraph 4 should be 10-23-11. Hope to read more posts related to this topic on your blog. Yes, I used to work on frequent subgraph mining and published two papers on this topic. The main idea is to implement parallel versions of gSpan on multi-core processor computers. Recently, I have seen some works developing algorithms on distributed systems using Map-Reduce. Interesting. I have been reading on subgraph mining recently. I have implemented some existing algorithm for subgraph mining in Java for SPMF, recently. But I have unfortunately found that the algorithm was theoretically incorrect, so I have not released the source code. I think that subgraph mining is interesting. I will probably try to write a paper about it when I can find some time. But now, I am just at the stage of looking for some ideas, to see if I can get some good idea about that topic. Thank you for your time and effort to write this post. I am doing research on graph based indexing. Firstly, I try to retrieve frequent subgraphs and build the indexing method using them. Your blog is very helpful to me. I am looking forward your next blogs. Thanks for your comment. It seems like a very interesting topic. I have seen some related idea before for sequences. There was a paper several years ago called SeqIndex, where they used to find sequential patterns in sequences to index a set of sequences. In case you don’t know about that paper, you may want to have a look. But I guess that graphs has many other challenges, so it should be an interesting project! I am a Ph.D student in Myanmar. My research focus on indexing scheme that is based on frequent subgraphs which are mined from RDF data. I am ambiguous which one is the first process for me i.e., extracting frequent subgraphs from the RDF dataset or grpah representation such as cannonical labeling. Please kindly give me your suggestions! Thank you for your effort to write this post. I am a Master student and I am working on Subgraph Mining. Do you know that which algorithms work with disconnected graph data as input dataset? I mean if we have two graphs as input but both of them are disconnected graphs and we want to find all subgraphs, which algorithm is the best? I would be appreciated if you answer my question. Thank you for your time and response. Glad you like the post. I think subgraph mining is a very interesting topic but I am also quite new to this topic, so my answer may not be accurate. I think that most subgraph mining algorithm will find patterns that are connected but the input graph(s) does not need to be connected. So in other words, I think that the restriction of being connected only apply to the patterns that are found rather than the input graph(s). I need a graph dataset of Facebook or any other Social Media Web Site. I need different graphs , in which each graph represent an individual user details. Thank you for your time and effort to write this post. I am Ph.D Student in Iran. I am doing research on frequent subgraph mining from single large graph as Ph.D thesis. My research focus on parallel mining frequent subgraph from single large graph. I need a advisor in parallel computing specially map reduce frame work or graph mining area. Can you guide me in this area? Glad you like the post. Graph mining is a good research area for doing your thesis. I am personally not very familiar with Map Reduce, and cannot really recommend an advisor related to that. I think that the most important is to first master the concept of MapReduce, and then to see how you can transfer concepts of graph mining to Map Reduce to create a new algorithm. So I would suggest to first read on map reduce and do some programming examples. 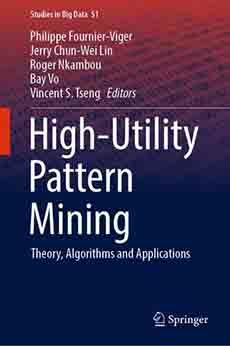 Then, to read about graph mining, and especially map reduce algorithms for graph mining if there are some already. You could then start by implementing some know algorithms and then think about how to improve them. Thank you for writing this article. I was having a hard time understanding why the vertice labels could be non-unique and was wondering what kind of real life scenario such graphs would apply to. This really cleared it up for me!